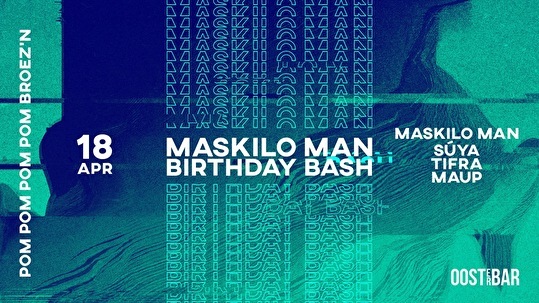 Maskilo Man is celebrating his 30th birthday in one of the most intimate clubs in Amsterdam: Oosterbar. We open up early, capacity is limited, so do the math. Maskilo Man will be accompanied by close friends, all representing his musical journey over the last few years. The evening kicks of with a blend of African, soul and funky house by DJ Maup. Next in line is the upcoming house producer Tifra dj. He will take us on a deep and groovy ride. Last but not least, Súya and Maskilo Man join forces and will end the evening in style with a 3 hour b2b set filled with Arabic, breakbeat and electro gems.